After cutting out doves freehand, Jamie Langhoff delves into making kid-themed artwork that sells well during the holiday season. Her assistant, Amanda Burns, works in the background. As a child in her native New Hampshire, Jamie Langhoff would spend hours with her cherished cardboard box of Crayolas, meticulously arranging each of its 96 crayons by hue. Now, more than two decades later, the 30-year-old has, for the most part, set crayons aside. 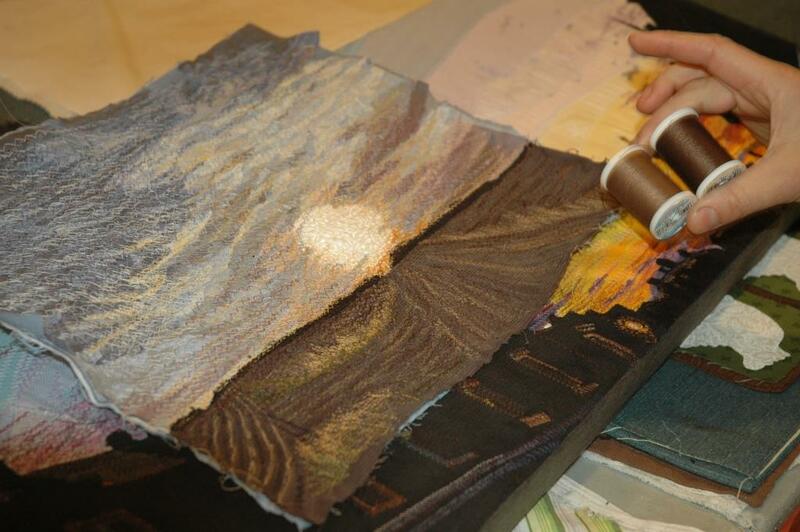 But that early fascination with juxtaposing burnt sienna with vivid violet, wild blue yonder or razzle dazzle rose was evidently ideal practice for her current career in Washington, D.C., as a textile artist. Jamie Langhoff seeks to encompasses the four Aristotelian elements—earth, air, fire and water—in each of the pieces of upcycled fabric appliqué artwork she designs. Indeed. From a distance, her intricate and appealing blends of landscapes and cityscapes seem to be created with paintbrushes and oils or watercolors. However, examine them closely and it becomes clear her media are elegant arrangements of cloth and thread. 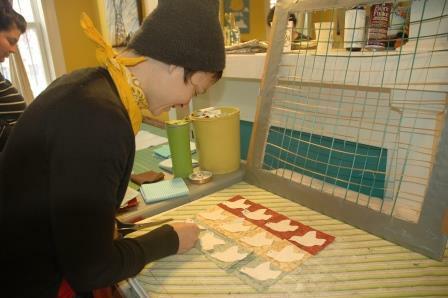 Her simpler and smaller pieces of upcycled fabric appliqué artwork—measuring up to 8 by 8 inches—are part of this year’s Green Gift Fair at Community Forklift, which is open in the Forklift’s Edmonston warehouse through Dec. 29. Langhoff’s much larger and more detailed work is available at Eastern Market and the circuit of craft and art fairs she frequents. As well, it’s available online via www.seeinginfabric.etsy.com and www.facebook.com/seeingfabric. 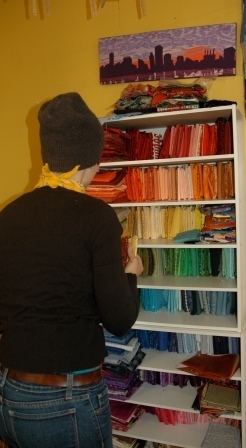 Textile artist Jamie Langhoff keeps her fabric inventory well organized at Seeing in Fabric studio in Northwest Washington, D.C.
Before creating Seeing in Fabric in spring 2011, Langhoff didn’t think she was ever destined to earn her living as an artist. After graduating from high school in southern New Hampshire in 2001, she opted to forego college for an opportunity to learn the business side of a grocery operation. Four years later, she enrolled at the University of New Hampshire, graduating in 2009 with a major in philosophy and a minor in art. Langhoff nurtured her art habit in her early college years by designing T-shirts that most of her friends refused to wear—only because the results were so striking that they seemed more suitable for framing. She shunned screen printing and painting in favor of fabric appliqué, a skill she learned from her seamstress mother. “I wanted my designs to be concise and accurate,” she says, recalling with a smile how her no-nonsense New England upbringing had convinced her that using paint or dye would be cheating. After college, she started looking around for a place to settle where the winters weren’t so harsh and the academic grind was nonexistent. Organic farming in Florida served as a temporary answer. On one of her trips south, she took a detour to the nation’s capital to visit a friend and found herself captivated by neighborhoods full of rowhouses and a burgeoning art scene. She moved to the city in April 2010 and quickly found a restaurant job. Within a few months, a friend tracked her down via e-mail to ask if she was still making T-shirts. The 1968 Singer sewing machine is a workhorse that can handle the miles of thread textile artist Jamie Langhoff needs for her straight and zigzag stitching. Soon, she worked up the nerve to set up a studio in the front room of her group home in the Cardozo neighborhood in Northwest Washington. Swatches of fabric in shades as diverse and bright as her long-ago Crayola box are stored in easily accessible shelves near one corner just a few steps from the long table where she cuts and assembles materials. 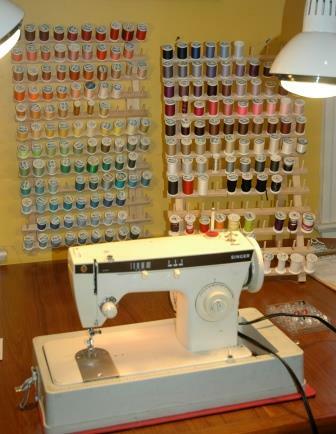 Rainbows of spooled thread, 200-plus colors in all, hang shipshape above the mechanical workhorse of her operation—a 1968 Singer sewing machine. “I wish I could say ‘yes’ when people ask if this was my mother’s sewing machine,” she says about the vintage machine she paid $50 for years ago at a shop in New Hampshire. A mechanic at that shop told her an older machine was likely her best bet for the long haul because newer models require too much maintenance. Langhoff and the Singer are quite the team. Using scissors, she snips freehand the shapes she needs. Small pieces of artwork require as few as 14 cut shapes. Larger ones, which measure in feet, not inches, weave together thousands of cut shapes. The Singer takes care of the two types of stitches Langhoff relies on most heavily—straight and zigzag. But Langhoff is calling all of the shots. And 10-hour days in her workshop are de rigueur. Color matters. Jamie Langhoff signature artwork fabric shows how selecting just the right cloth and thread give her pieces a hyperphotorealistic look. Whether depicting furrows in a farmer’s field, a sky at sunset, a skyscraper or an electric transmission wire, Langhoff is intent on selecting just the right cloth and thread to advance her subject to a hyperphotorealistic level. Colors, shades, textures and patterns matter. As do the length of width of the thread. She’s always seeking an aesthetic that encompasses the four Aristotelian elements—earth, air, fire and water. Textile artist Jamie Langhoff delights in blending the natural and man-made worlds when piecing together her intricate artwork made entirely of fabric and stitching. “The biggest compliment I can receive is when somebody tells me, ‘I always thought those messy wires were ugly but you’ve made them beautiful,’ ” she says.She delights in melding components of the natural world with objects that many see only as ugly signs of human intrusion. For instance, she will pair birds or trees with the electric transmission and distribution lines that power our economy. Langhoff tries to keep her own encroachment small—and green. Friends regularly leave bags of old clothes at her doorstep, so between that and a supply from quilters, textile samples and thrift shops, she has access to most every type of fabric imaginable. Her waste not, want not ethic means very little is not reused or recycled. Though she can’t count on the Forklift for sewing supplies, she has rifled through the store’s hardware section to buy hinges for the folding boards that display her artwork. She also turns to the Forklift for gardening tools and lumber for the raised vegetable beds she built in her group home’s backyard. It’s similar to the links she makes with customers who recognize the value and allure of one-of-a-kind artwork that doesn’t come off an assembly line. * The Forklift’s fifth annual Green Gift Fair, which runs through Dec. 29, features the handiwork of 35 organizations and individuals. 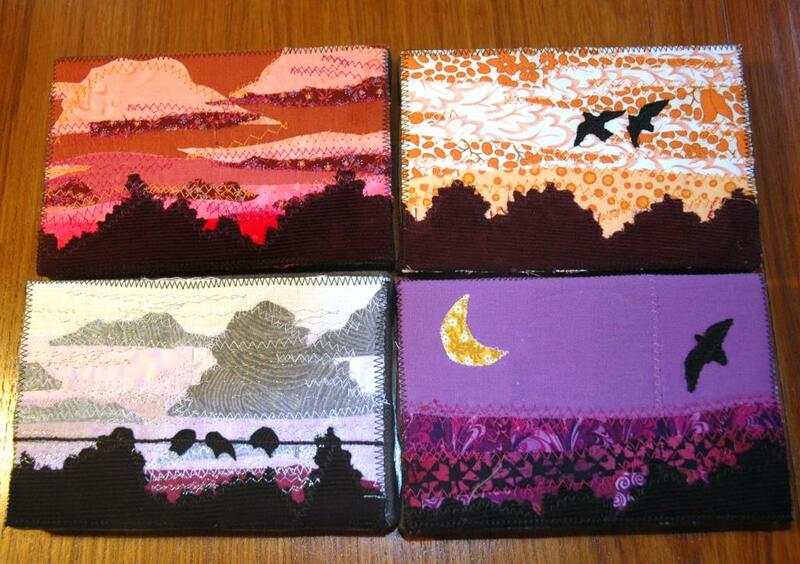 Jamie Langhoff’s Seeing in Fabric artwork starts at $20, while prices for other items in the fair start as low as $1. In addition to fabric appliqué artwork, gift seekers will find an assortment of eco-friendly and affordable green-themed wood sculptures, paintings, clothing, metalwork, woodcrafts, toys, baby gear, beauty care products, candles, greeting cards, housewares and stained glass mosaics.